The APX in studio at KPFK with Kristi Lomax. Dee & Erika Rhodes are The APX, an Atlanta based duo pumping out modern funk hits, steeped in percussive synth bass, memorable hooks, and detailed dance melodies. 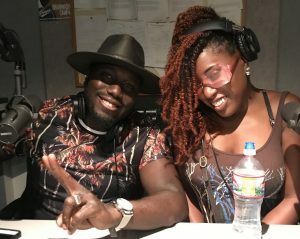 They came by One Track Mind to talk about there musical beginnings in Detroit and Staten Island, how Erika learned to play keys as the group booked gigs, and why they’re dedicated to the funk. This show originally aired July 13, 2018. Follow The APX on Instagram, Spotify, Beatport, Soundcloud, and their website. Copyright © 2019 Lomax Wax.